I've learned that when you want to support someone who's critically ill, loving them isn't enough; you have to meet them where they are. That means letting go of your wishful thinking, your denial, or your selfish need to put a positive spin on things and allowing the other person -- the one who's dying -- to set the tone. Death is a subject most people avoid talking about. We don't even like to think about it. But the truth is, everybody dies, and if we don't think about it or talk about it, we'll never learn how to deal with it in the best way possible. Over the course of my life, I've lost a number of loved ones. It's been painful, but I've learned a lot from these experiences. If they're optimistic, be there with them; if they're sad, mirror them in their sadness; if they're afraid, acknowledge their fears; if they're angry, validate their experience. It's not that we encourage their suffering; it's that we're most comforting to them when we reflect their experience back to them. We can be the most loving with someone who's dying when we're simply present with them, as opposed to trying to cheer them up or take away their pain. The sick person benefits from our quiet, accepting presence. That's how we demonstrate true compassion. It's hard to watch a loved one suffering. It feels so overwhelming to know that we can't change their situation. Sometimes, in our helplessness, we mistakenly believe that we should try to put a positive spin on things, but that's often more for our own benefit than for the benefit of our loved one. 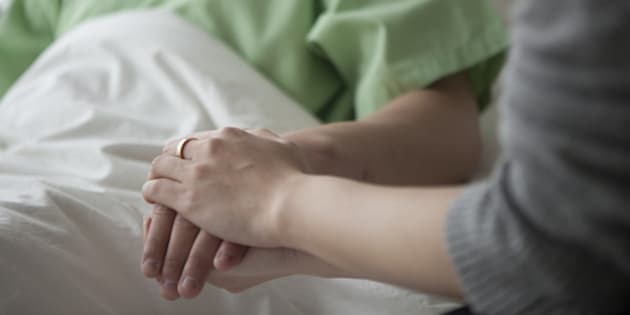 Being supportive to someone who's dying is about letting go of our own fears, feelings of helplessness or selfish needs to feel like we're "doing something" to make it better. Most of the time, the best we can do is just be there with them; letting them know that we see what they're going through and that we care. Small acts of kindness are better received than grand gestures, and commiserating with the sick person's suffering is preferable to putting on a happy face. I've seen how when we allow the other person to guide the interaction, it frees them to be authentic in every moment. They're able to be talkative when they feel like talking, quiet when they have nothing to say, upbeat when they're feeling optimistic, or upset when they're in touch with their pain and fear. This attitude of acceptance isn't an easy one for most of us to achieve. We tend to be doers, always focused on fixing things; but death is the one thing that can't be fixed. It will happen on its own terms, regardless of our input. We need to surrender to the reality that our loved one is very ill and that at some point, maybe not immediately but eventually, their illness will take them. We don't need to say or do anything that will make them feel worse, but we also don't have to pretend to ourselves, or to them, that things are fine. One of my family members who passed away recently from cancer used to complain to me about how annoying it was when people would come to visit her and say, "Everything's going to be okay." She didn't want to hear that because for one thing, she actually didn't feel okay, and also, because how could they know what was coming next? She didn't want to hear people being pessimistic about her situation, but equally, she didn't need empty reassurances. It bothered her when people tried to cheer her up with promises that they weren't in a position to keep. Being with people who are extremely ill can be painful and frightening. We have to get over our own tendencies toward denial, and our urges to make the pain go away. We have to tolerate the fact that our loved one is suffering, and that it hurts to watch them in pain. There are a lot of things we can do and should do to make the other person more comfortable; we can help with their pain, nausea, weakness, and discomfort. We can soothe them, comfort them, enjoy simple things like having a cup of tea with them; we can even crack jokes with them. We can momentarily distract the person from their suffering, but we can't run away from the truth. The sick person needs us to be real with them, not to pretend that the situation is anything other than it is. Acceptance, surrender, compassion and love. Maybe a bit of courage, as well. These are the things I learned about when spending time with loved ones at the edge of death. And join me for my talk about what I learned at the edge of love and death, at MoMondays next event. It's at the Hard Rock Cafe in Toronto, November 23rd at 5:30 pm. Hope to see you there!